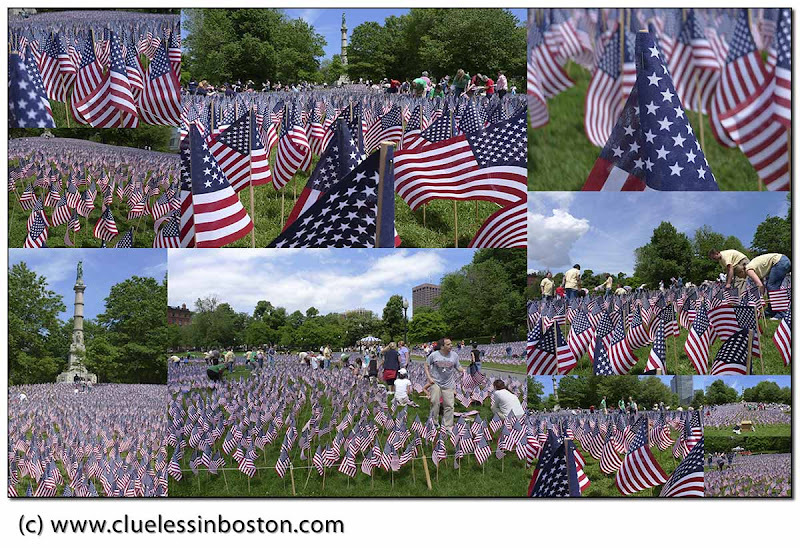 In advance of the upcoming Memorial Day weekend, volunteers posted flags on the Parade Ground in the Boston Common on Wednesday. The tall monument you can see in two of the pictures is the Civil War monument to soldiers and sailors. Truly moving and a most appropriate display of honor. Very moving and nice to see that people still pay respect for those who fought for our freedom. Flags in numbers is so impressive! BTW, yesterday I was on my way to the Lakes region and I remembered your posts last year from Cornish and the Saint-Gaudens home, so I stopped there on the way. Very impressive! It doesn't open up completely for another week, but just walking the grounds and peeking in the windows were fun. The Shaw sculpture alone is worth the visit. I especially like the ones towards the left of the montage... so quietly moving. Unique, and I have never ever seen so many flags before. Strong images.